Personalized Zippered Bottle Koozies in Bulk. Promotional, Inexpensive. Budget Prices for USA, Canada. For 12 oz. bottles. Bulk customized bottle koozies (coolers) at the lowest prices in USA and Canada. 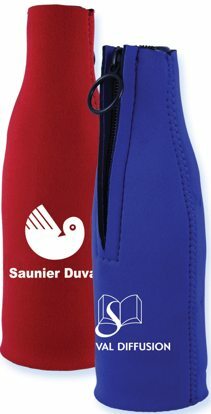 Our bulk discounted zippered bottle koozie is collapsible and holds 12 oz. bottles and long necks. American clients pay no taxes. Free artwork design. We will send you a proof for your approval before production. Unit prices below Includes your 1 color custom imprint on one side only. We also supply blank bulk (not imprinted) bottle coolers: take 10% off. Production time is 5 days after proof approval. 2nd Imprint Color Requires a Process, Add $0.30 per koozie & additional 5 Days producttion. Imprint Area: 2" W x 3" H, one side only. 2nd Imprint Color Requires a Process, Add $0.30 per koozie & additional 5 Days producttion.